Sunstone shows a Schiller effect where the metallic inclusions reflect light in a blaze of color. 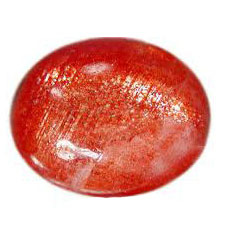 Sunstone is metallic in appearance due to the reflective inclusions of crystals. In ancient times it was used by Magicians to invoke the energies associated with the Sun. This sgem stone helps you to increases vitality and courage and promotes a sunny outlook. Sunstone strengthens the wearer abilities of self-discipline, humility and desire for service to the greater good. Do you want to have one for yourself. We offer this rare gem in various shapes and sizes.